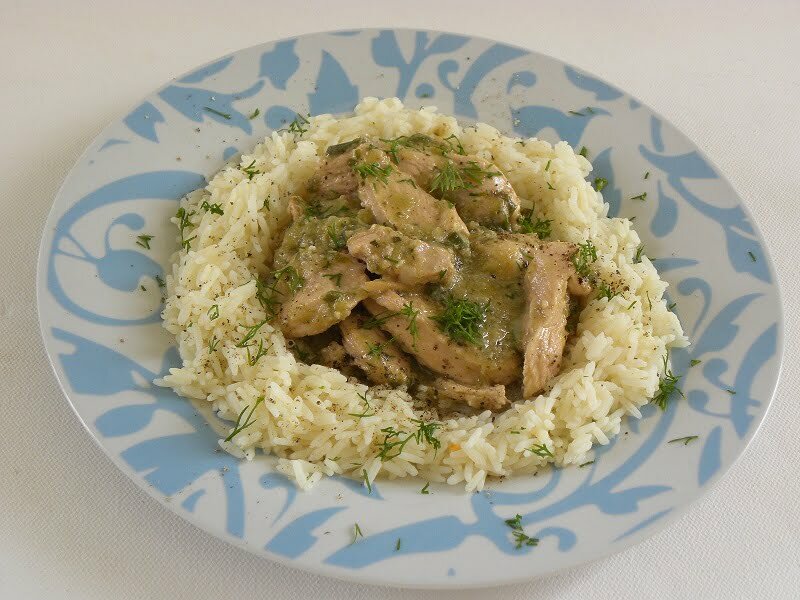 Chicken with Leeks is a very simple but delicious and light dish which can be whipped up in no time made with Greek yoghurt and pesto which makes a very creamy sauce. Christos Anesti and chronia polla. This is our wish after Easter which means Christos Anesti (Christ has risen) and may you live for many years. Last week when we were fasting, I made a vegan pesto with Kafkalithres and Myronia and used it to make Spaghetti aglio e olio with courgettes and spinach where I used the same pesto. The leftover was stored in the freezer. Today, Monday after Easter it is still a public holiday here in Greece and all the shops are closed, so I wanted to cook something light, as my husband is on a gallbladder diet, with ingredients I had at home. Frozen pesto with no cheese in it. If you live in Greece, I urge you to try these herbs, raw in salads or cooked, as they give an amazing taste to food, otherwise you can still use any other pesto you like which will, of course, give a different taste. The leeks add a delicious sweet flavour and of course the addition of Greek creamy yoghurt in the end makes it even more delicious and creamy. While I was boiling water for the rice I added one bio chicken bouillon in the water and used 1 ladle of this broth to cook the chicken but you can use any broth you like or just water. I have a small note on garlic, which I discovered accidentally, while giving instructions to my son who lives in England how to cook. In my recipes I have never used more than 2 cloves of garlic and when I do, I even remove any fine green shoots that may be starting to sprout, since their flavor and aroma are particularly harsh and penetrating. My son explained to me that in England he uses 5 – 6 cloves and they don’t even taste like garlic. Greek garlic is very strong and 1 clove is enough to send even the dracula away he said 🙂 So, this explains why I see recipes with people using so much garlic in their food and I always felt discusting with the thought of the smell it would produce! My point here is that you should adjust ingredients according to their taste and flavour. For the pesto: In a food processor add the garlic, 1/3 of the olive oil, salt, pepper and pulse a few times. For the chicken: In a large, heavy, skillet with a lid, heat the oil over high sauté the chicken on both sides, for at least 5 – 6 minutes. Add the leeks and spring onions and sauté for a few minutes. Then add the garlic and sauté until starting to soften, then add the wine. Add salt and pepper and pesto and mix. Add the vegetable or other stock and cover with the lid. Cook until the chicken is fork tender, about 20 minutes. Uncover and mix in Greek yoghurt. Serve with rice of pasta. In a large, heavy, skillet with a lid, heat the oil over high sauté the chicken on both sides, for at least 5 - 6 minutes. Disclaimer: I’m not a doctor, I’m not a surgeon and I’m not a dietician. Each person may have different symptoms, so please consult your doctor before following this diet. A splendid and mouthwatering dish! Very spring-like and refined tasting. Wow!! !What a delicious chicken dish,Ivy! Full of flavor and I love the idea to serve it with rice to soak of that sauce! Makes me hungry..super delicious dish.. Thanks for this recipe and hope you are having a great week! I never heard of those herbs before! The chicken looks rich and delicious! I like the creamy mix of yogurt and pesto. Beautiful dish, so light and elegant. The picture is really appetizing. You are totally right about garlic, here in the UK the imported garlic we get is almost flavourless, while in Italy (and I’m sure in Greece as well) it is way more pungent. Here I can chop garlic and I won’t even be able to smell it on my hands! A delicious dish I would love to taste! Thanks Ivy for the recipe. Χριστός Ανέστη! Beautiful dish, Ivy! I LOVE leeks and pesto is great on pretty much everything. Hi Ivy, I see you are still using that kafkalithres pesto we exchanged notes about the other day. I want to try that herb someday, I’ll put it on my list of things to do when I visit Greece some day. Are the winter months the only time it is available? Yes unfortunately, only during winter and early spring. Wow, only 2 cloves of garlic. Greek garlic does sound very strong! It is definitely an important point about adjusting ingredient quanitities. Sounds like a very tasty dish with rice. Wow!This looks so good. First thing it is a healthy option because you use chicken breasts and I love how herb pesto is added to add a fresh flavor to it. I will try to cook this at home.